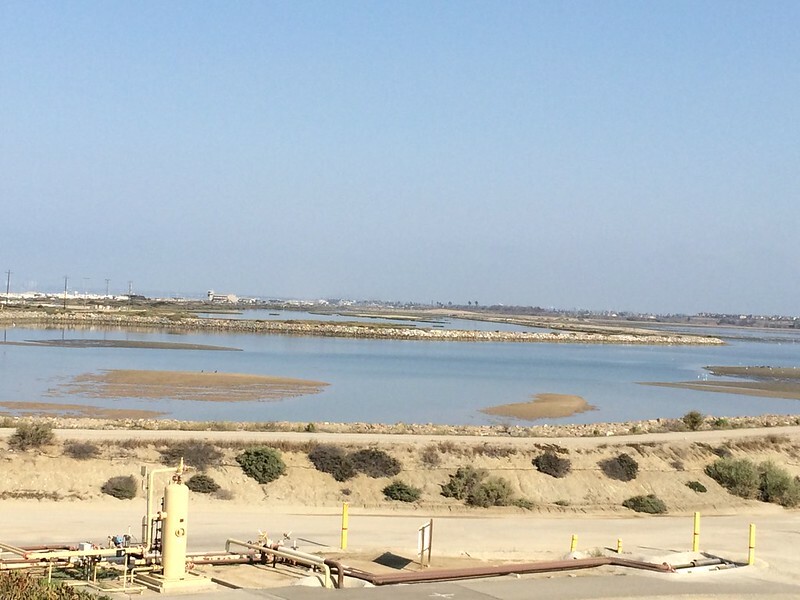 The Bolsa Chica Lowlands Restoration Project created or rehabilitated nearly 600 acres of marine and wetland habitat in Orange County, CA, restoring part of what had historically been a vast estuarine ecosystem. The project, the result of decades of planning and cooperation by the public and government agencies, is the largest wetland restoration in Southern California history. The design included mandatory maintenance of an open ocean inlet to ensure the wetland continues to function and to protect the biological benefits gained by the restoration investment. Restoration culminated in 2006 when the new full tidal basin to the ocean opened. Post-restoration monitoring has shown that this basin has meaningfully increased the availability of bay habitat, improving southern California fishery resources. Nearly every fish species captured during the biological monitoring program was represented by juvenile size classes (and usually adults as well), demonstrating the role of the basin as nursery habitat for spawning or post-larval settlement and rearing. Commercially important species such as California halibut and white seabass are common in the Basin. The type and size of fish captured also reflect the extensive eelgrass meadows that now thrive there. These eelgrass meadows support resident fish species, provide egg-laying substrate, and protection for breeding species. Bolsa Chica is a critical stop for migrating shorebirds on the Pacific Flyway. With the introduction of tidal influence, the mudflats created by the restoration provide a rich invertebrate community that is a food source to these birds. Over 10,000 shorebirds have been observed on the restored mudflats during a single survey. The project also created three nesting sites for the threatened western snowy plover and endangered California least tern. These sites are intensively maintained and monitored and provide critical additional habitat for these species. Nearly all of the biological benefits of the restoration are a result of introducing daily tidal influence from the ocean. As with most human-made wetlands, the inlet requires maintenance to ensure connectivity with the ocean. Sand that naturally flows down the coastline is continually pulled into the Basin by the waves and tide. Without regularly removing sand from the inlet, the Basin would become closed off from the ocean, causing degradation of water quality death of the biota in the basin, damage to intertidal plant communities, and loss of an important food source for nesting birds. It is critical that the tremendous investment of time and money, and resulting biological successes, be protected by continuing inlet maintenance, water control, and adaptive management. The initial $15 million set aside for ongoing maintenance is inadequate to meet the long term needs and Bolsa Chica is facing a critical funding deficiency. This situation is seen regionally, as most major coastal wetland restoration projects in southern California move into the long-term maintenance phase. Continued maintenance is critical to the sustained success of all these restoration projects. 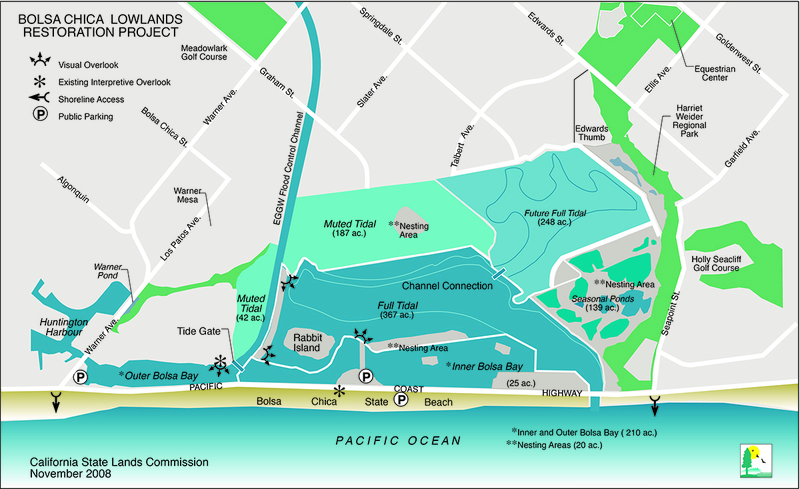 The continued function and success of Bolsa Chica is of significant importance California to preserve coastal wetland and endangered species habitat, and provide public access to Public Trust lands. Partnership agencies for the design, construction and management.